Ralph Erenzo is the unsung hero behind the entire craft beverage boom in New York. 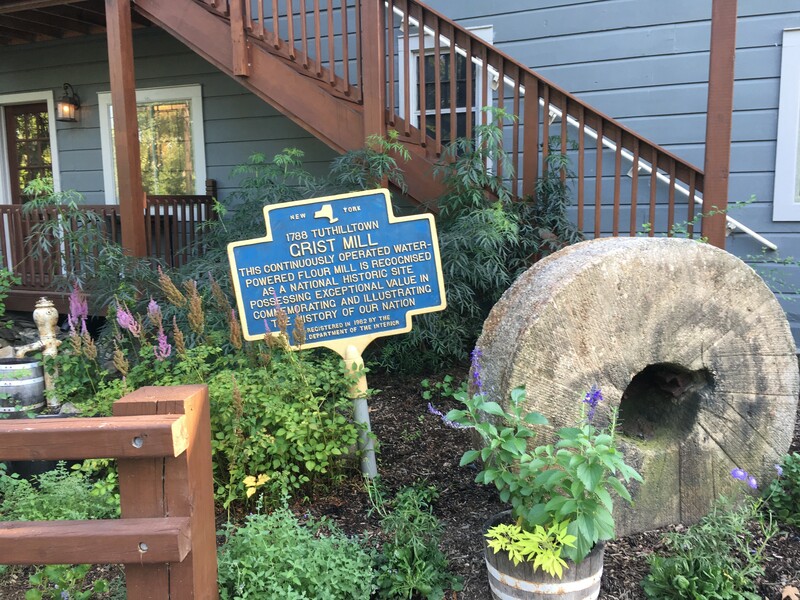 After the town of Gardiner stumped his plans for a climbers' lodge on the site of the Tuthilltown Gristmill at the base of the 'Gunks in the early 2000s, Erenzo decided to pivot hard. His new objective, along with partner Brian Lee, became to use the historic property to distill whiskey—a spirit that hadn't been commercially produced in the state since Prohibition. Erenzo acquired the necessary permits to distill in 2005, but felt hampered by the restrictions imposed by existing laws, which did not include permission to have a shop or conduct samplings or tours on premises. 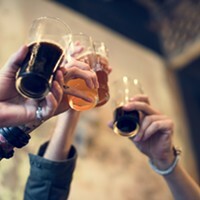 In an attempt to amend the license so that it would include the right to consumer sales, Erenzo prompted the Farm Distillery Act of 2007, which effectively opened the floodgates for craft distillers in the region. 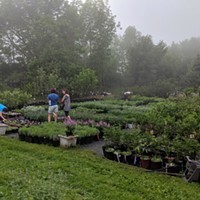 Over the past year and change, the new owners have been making gradual improvements to the facilities and grounds, which feel very much like a school campus with clusters of buildings, sprawling lawns, and a picturesque brook. 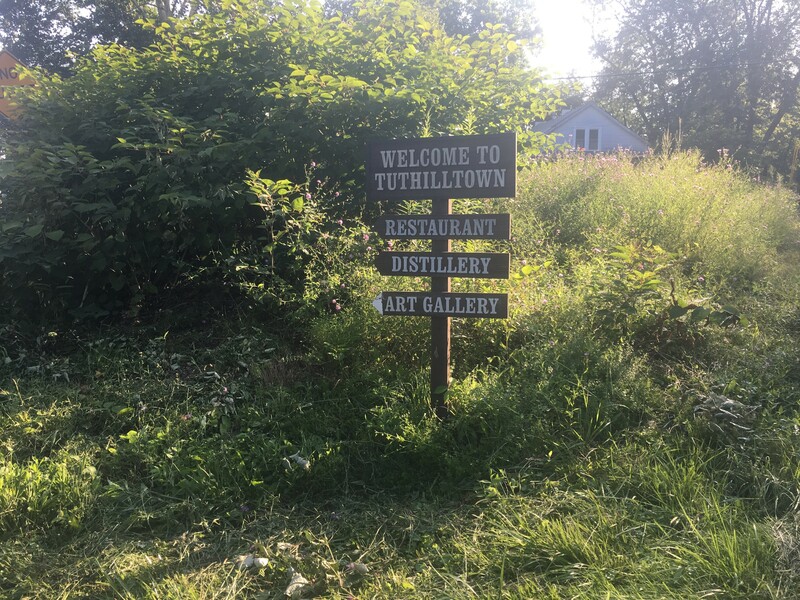 One of the biggest changes to the Tuthilltown property is the newly branded restaurant, Char 1788, which opened this past spring and is billed as "a farm-to-table restaurant featuring American cuisine and a focus on locally-sourced products and ingredients." On a balmy Thursday evening, four of us trooped out to Gardiner to taste the food. 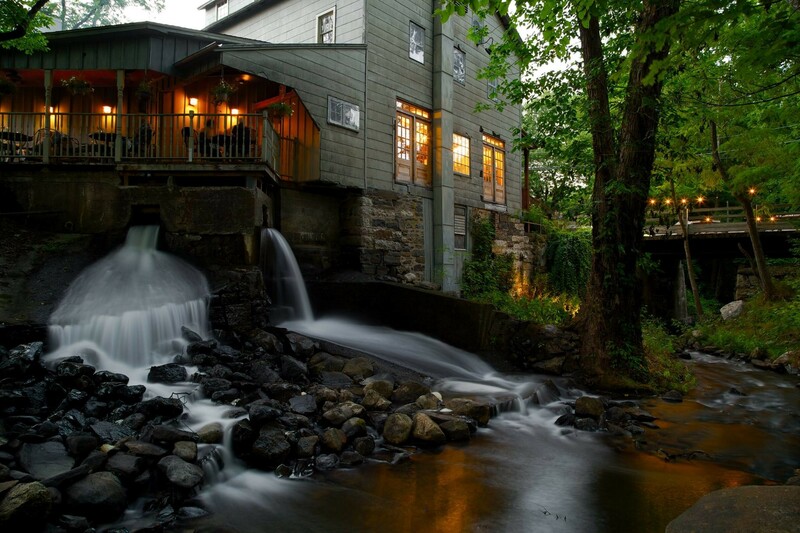 The restaurant, located in the historic grist mill building, has a warm, inviting vibe, with heavy, exposed wood beams, a copper-topped bar, and plaster walls. 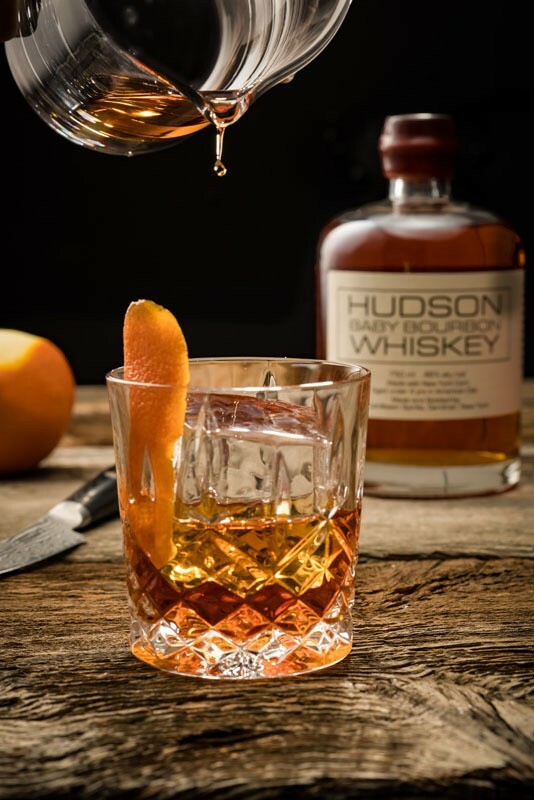 Sit at the long center island bar and sample Hudson Whiskey at its source with a flight, or order one of the signature cocktails made with Tuthilltown spirits, of course. The Randolph Exchange ($13) is perfect for a hot summer night. 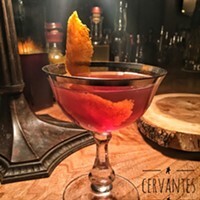 Made with Hudson Four Grain Bourbon, sherry, ginger juice, and lemon, and garnished with a slice of candied ginger, it has kick to while still being refreshing. 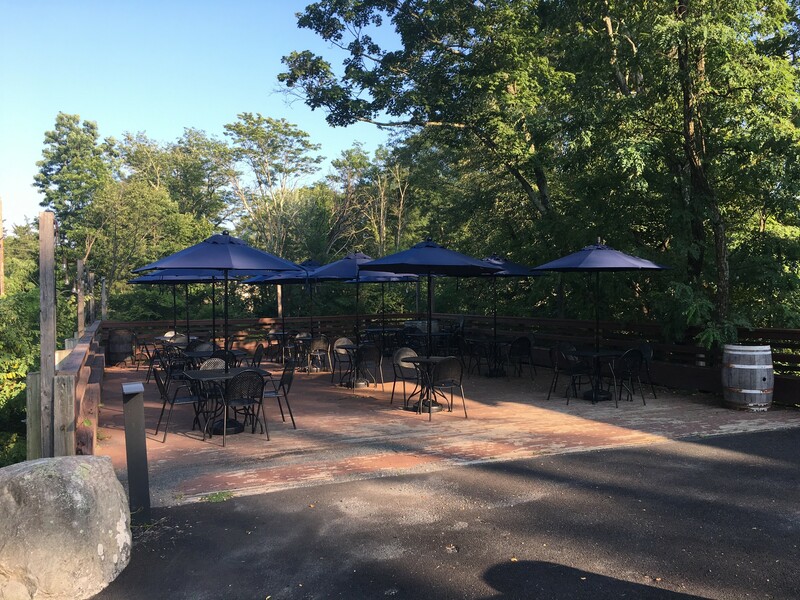 You can dine downstairs in the tasting room, or on a beautiful summer evening sup outside on the porch or the fresh-air patio, both overlooking the water. 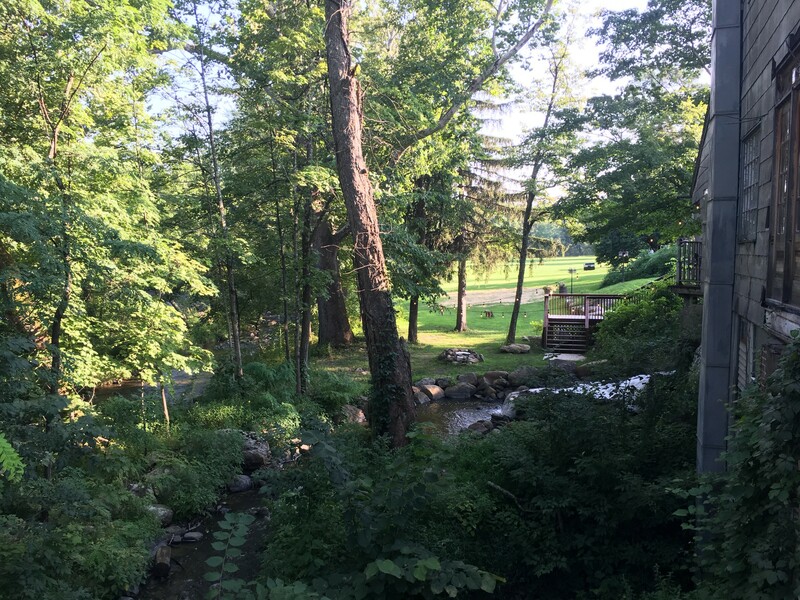 (Be warned: the creek runs under the original mill building and cascades down with a roar, so if you sit on the porch it will be quite loud—but beautiful.) The upstairs is reserved for overflow restaurant seating and special events. To kick the meal off we tried the variety of appetizers. The rabbit confit ($13) stood out—a creamy housemade delicacy that comes with a freshly foraged garlic mustard greens, cherry jam, and red walnuts. 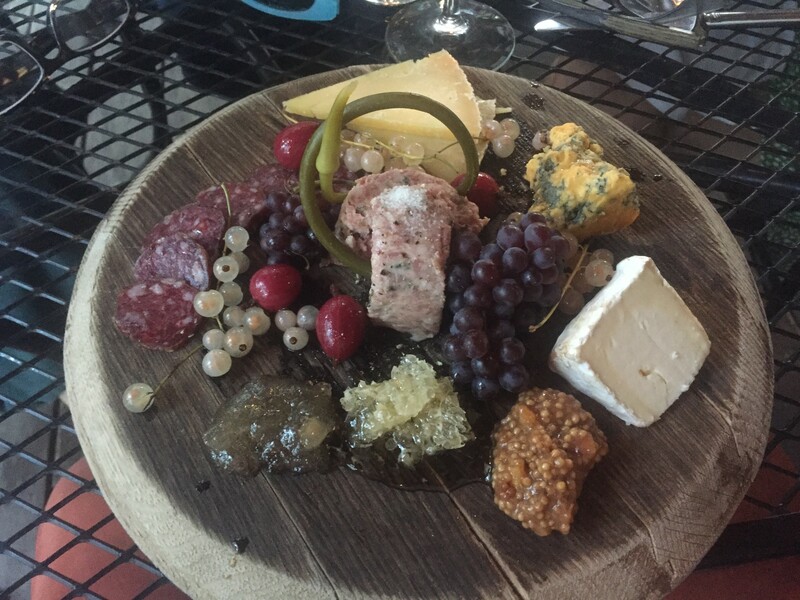 Another highlight was the 1788 Board ($17), an impeccably curated selection of local charcuterie, country paté, cheeses, fruit, and housemade pickles and preserves. With gooseberries, Japanese table grapes, and ambrosial honeycomb to sweeten the deal, this was a refreshing change from your run-of-the-mill (ha!) charcuterie board. While we dined, dusk settled in and people piled out of their cars and onto the lawn for the outdoor screening of The Goonies. Movie nights are just one of the many community-facing events Tuthilltown is organized under new management. The main courses don't run cheap. You an expect to spend between $20 to $30 (unless you order the Char Burger for $15). The menu features a range of options including the vegetarian Summer Squash dish ($22), which comes with gnocchi, Edgwick Farm goat feta, and pistachios, two fish dishes and a porkchop. The Grilled Sirloin ($30) really stole the show. Only for the most committed of carnivores, this bourbon-glazed steak is served with creamy bone marrow spinach and oxtail marmalade— a rich, succulent feast that will definitely fill you up. The produce for Char 1788 is all sourced locally, as is much of the meat, cheese, and charcuterie. While the restaurant is still working out some of the kinks that always accompany a change in ownership, the ambiance is warm, the waitstaff friendly, and the scenery unbeatable. The price point will likely make this a spot for special occasion dining only, but if you've never been to the property it's worth dropping by for a distillery tour and whiskey tasting, or else just cocktail on the porch.